Here we have the first of our CPU / Processor mega tests, featuring the Intel Kaby Lake i3, i5 and i7 chips. Kaby Lake chips are the name for Intel’s 7th generation processors and they are currently the latest chips available in their mainstream CPU lineup. There are a number of variants available in this series, we have picked three of them to benchmark in a range of tests to try and give you a clear understanding of the strengths of each chip, and the relative performance differences between them. The results of these benchmark tests will follow along with commentary on how this would impact the different types of trading platforms that you might be running. I hope you find it insightful! These tests were all performed on identical hardware with the only change between tests being the actual CPU tested. The spec of the testing computer was: Asus Z270-P Motherboard, 16GB 2,666Mhz Crucial RAM, 240GB Kingston Solid State Hard Drive, nVidia GT1030 2GB Graphics Card, BeQuiet 600w Power Supply, Antec 302 Case, Arctic Freezer CPU Cooler. From a software point of view the computer was running: Windows 10 Home Edition, Google Chrome v59, Handbrake 1.07 (64-Bit). All tests were repeated 3 times with the average of the 3 results taken as the final tested result. We will start with some browser tests, these are tests that run inside a web browser and perform a variety of tasks sequentially. Tasks include things like displaying and updating graphics and charts, performing different types of encryption routines, and many background calculations that most fairly complex web applications would require. These tests offer an excellent ‘real world’ indication of how trading platforms will actually perform on your computer. Many trading platforms actually run through a web browser so these are clearly a good fit for these types of browser tests. Other trading software such as MetaTrader 4 may not run through a browser, but they can operate in a similar fashion at times, putting the same kind of workload on a computer that a browser based platform might. 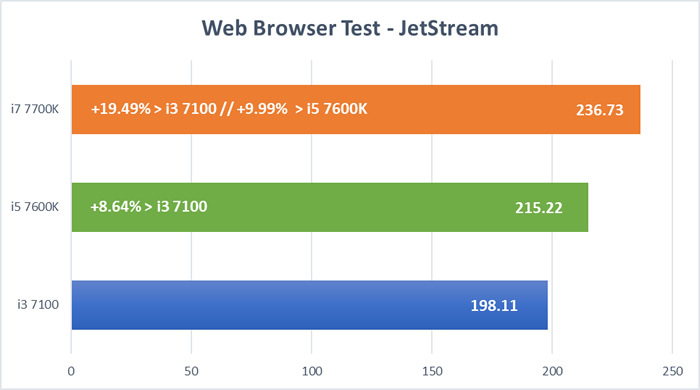 The JetStream test tries to recreate a wide range of web application processes and tasks, it is a great way to measure how your PC hardware can handle this kind of web application. As you can see the i5 7600K cpu gives an 8.64% performance improvement over the i3 7100 chip, moving up to the i7 7700K shows an almost 10% improvement over the i5 and almost 19.5% over the i3 processor. 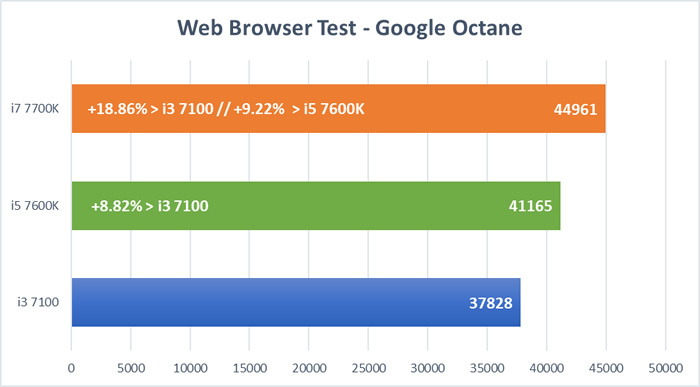 Like JetStream, the Google Octane tests attempt to measure web application speeds. Also like the JetStream tests, the move from the i3 to the i5 shows an 8.82% performance jump, the i7 takes it up a further 9.22% over the i5, which means an 18.86% boost over the i3 processor. 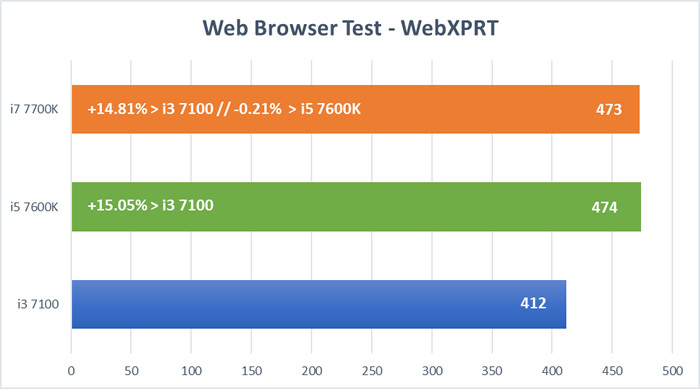 The WebXPRT is our final web browser benchmark, this test is a little different to the JetStream and Octane tests, it takes a lot longer to run and repeats a series of more graphically advanced tests such as photo manipulation, sales graphs, and stock option pricing. Interestingly the jump from an i3 to an i5 processor shows a 15% bump in performance, however moving up to an i7 gives nothing extra in performance. This could indicate that once a certain level of CPU performance is available, adding improved resources (like the i7) is a waste. 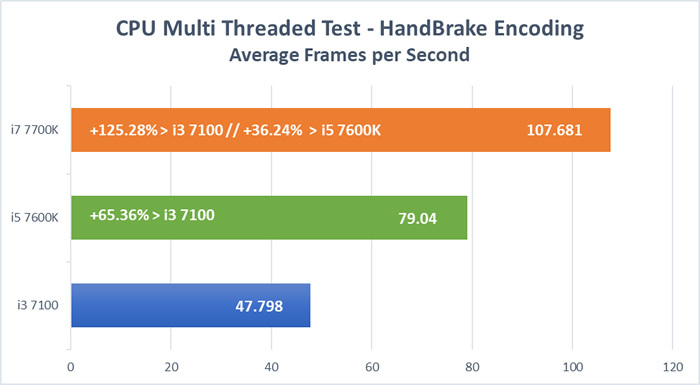 We might also conclude that the greater focus on background calculations in the JetStream and Octane tests means that they are more reliant on the CPU performance than the more graphical orientated tests of the WebXPRT benchmark. Overall these 3 web browser tests show that in all cases the i5 processor outperforms the i3 between 8.5 – 15%. Going for the i7 will improve performance 9 – 10% over the i5 in the more mathematical workloads but adds little to the more graphical tasks of the WebXPRT suite. We will now move on to testing the overall computer hardware itself and in this first instance we will concentrate on raw CPU performance. Our main testing suite for these tests is the Passmark Performance Test suite, this is a standalone benchmarking tool that tests all the major aspects of a computer systems performance. In addition to this I’ve thrown in an encoding test which is performed using a program called HandBrake, I’ll discuss this in more detail shortly. This first test is the overall CPU score from the Performance Test suite. It is generated by running 9 different tests which include mathematical calculations, physics simulations and number sorting algorithms. As you would expect, the three processors follow a trend of performance increases as you move up the range. Taking the CPU test into account only it is perhaps surprising to see that moving from the i3 to the i5 gives a 53% performance boost in these tests, this is more than I would have expected. Moving up to the i7 gives another 30% boost over the i5, this results in a whooping 100% increase over the i3 result, again, much more than I would have estimated. These are CPU specific tests, other factors come into play to determine real world differences in your program operation so please bear that in mind. This result is actually one of the sub tests for the overall CPU score displayed above. It highlights the raw speed of a CPU whilst processing one set of instructions, i.e. it does not determine the score on how good the processor may be at doing lots of things at once, the result is based on how quickly the CPU can perform individual instructions. Why have I picked this out to show? Some more intensive applications like photo rendering, will use a CPU’s extra multi-tasking capabilities (CPU cores and threads) to distribute intensive workloads more efficiently, most trading platforms don’t (yet). As such, this benchmark is a useful thing to look at as it can show a more real world view on performance levels. The benchmark shows that the i5 achieved a 7.31% increase over the i3, the i7 gained another 7.5% over the i5 and 15% over the i3, decent numbers but not quite as big as the overall CPU scores listed in the previous test. These results also mirror the web browser tests pretty closely showing that this measure of performance is a good proxy for how a browser based web app / trading platform benefits from each CPU. This is our HandBrake encoding test. It is not performed by the Performance Test suite, this is a separate benchmark. HandBrake is a program that converts videos from one format to another, this is a massively CPU intensive task. Crucially as well, HandBrake will take advantage of extra CPU cores and threads if they are available to boost performance. I think this is an extreme but good test to show exactly how well a CPU can handle multi-tasking workloads, this includes things like running multiple programs, charts, and trading platforms simultaneously. The extra CPU cores on the i5 give it a big 65% boost over the i3, the i7 has the same number of CPU cores as the i5 but also has some extra technology called Hyper-Threading, this allows more efficient use of each core. 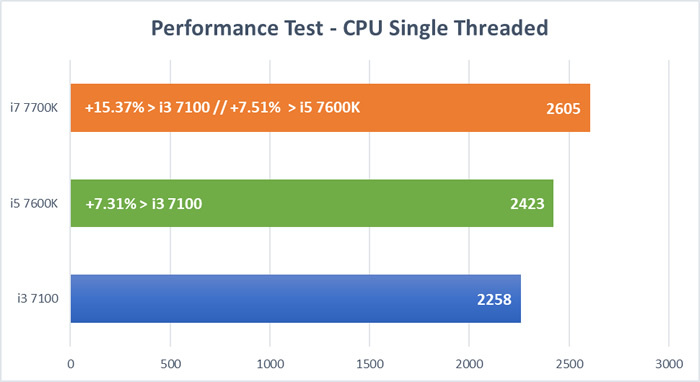 The hyper-threading helps push performance over the i5 by another 36% which means a 125% improvement over the i3. To sum up the CPU tests, it is clear that if you want to run CPU intensive software, or lots of programs simultaneously, then it is worth going for the i5 at least, going for the i7 will give you the biggest benefit in this area. If, however, you are looking for a system that is only going to run 1 trading platform, and you are not planning on doing anything else intensive on the computer then an i3 might just offer a suitable option. Graphics cards are an area where many people misunderstand what is required for a trading or multi-screen computer. Let’s have a look at a set of 2D and 3D benchmarks for our test systems, remember that the graphics card was the same across all three tests, only the CPU changed. Did this impact the graphics test results? You’d expect not. The first, and most important test for trading computers (in terms of graphics), is the 2D graphical performance test. A 2D graphics test measures things like how fast fonts and text are rendered (drawn on your screen), the speed of drawing simple and complex vectors (line and shape based graphics), and the responsiveness of standard Windows interface elements. Not surprisingly, the 2D performance for the i3 and i5 processors was pretty similar, the i5 system just edged in front by a marginal 1.35%. 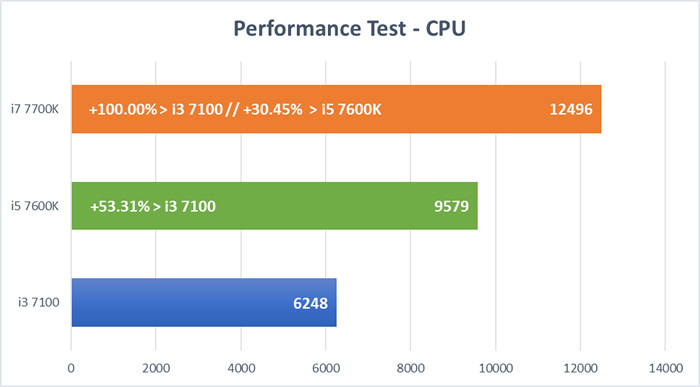 What was more surprising though was the i7 system result, this advanced performance for these tests by 10% over the i5 and 11.7% over the i3 based system. Why the performance jump on the i7? It’s hard to say, there is no extra tech on the i7 chip which would boost graphics performance specifically. Perhaps this is an indirect consequence of the i7 being an overall faster system, maybe the tests get started and passed along to the graphics card quicker? Perhaps the CPU helps with a bit of the workload here? Again, very hard to say but something is giving a performance benefit. The Performance Test suites 3D test uses Microsofts DirectX platform to perform a series of graphically intensive 3D benchmarks. DirectX is how video game creators utilise advanced gaming graphics cards to render the visuals in their games on a Windows computer. To be clear, only high end games will make use of this technology, standard programs such as Internet, email, word processing, and trading platforms will not get any kind of performance boost from a system that is better at 3D graphics, 2D performance is key. 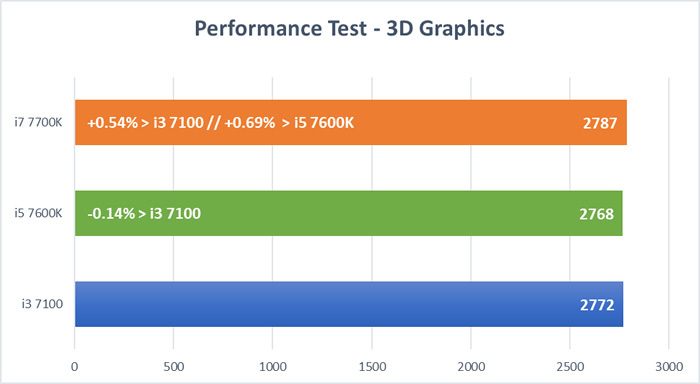 As you can instantly see from the graph, there is virtually no benefit from the i5 or the i7 chip for these results, all the work is done by the graphics card. Your hard drive is where your programs and data is stored long term, RAM (or memory) is where your open programs and data is stored whilst you are using them in the short term. Let’s have a look at how the different processors compare with these two metrics. When you open a program or file it is transferred into your RAM, any interactions with your programs or data files happens in the RAM, therefore, the speed at which your computer can access, read and write information into RAM will have an impact on your computers overall performance. Our testing shows that the i5 system scored just over 10% better on the RAM tests than the i3, moving up to the i7 bumped this another 3.7% over the i5, which equates to a 14.5% performance boost over the i3 system. The biggest benefit in this area is going from the i3 to i5, whilst the i7 is the fastest performer again, the difference is not as pronounced here. Your hard drive stores your programs and files, it is called into action the first time (per session) that you open a program or file ready to use. Once a file or program has been opened and is in the RAM then the hard drive performance has a negligible impact on your systems overall performance. These benchmark results combine tests that measure how fast data can be found, read and written back to the drive. 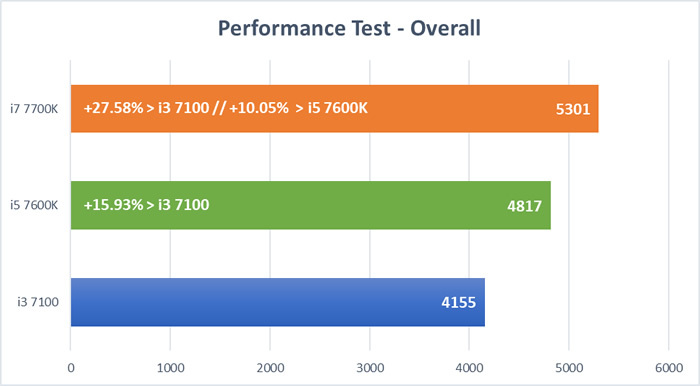 There is little between these tests, strangely the i7 performed slightly worse than both the i3 and the i5 however we are only talking a few percent. 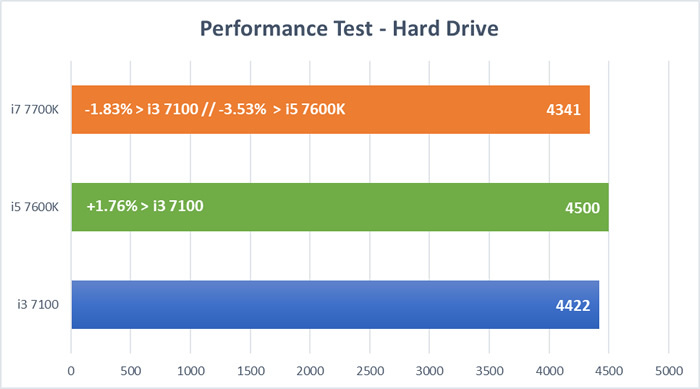 Digging into the individual tests that made up the overall hard disk benchmark above, shows that we would occasional get a poor result for one test for seemingly no obvious reason. I would not be too worried about the above, it’s nothing major and as mentioned, overall it will have virtually no impact on how your system performs once up and running. 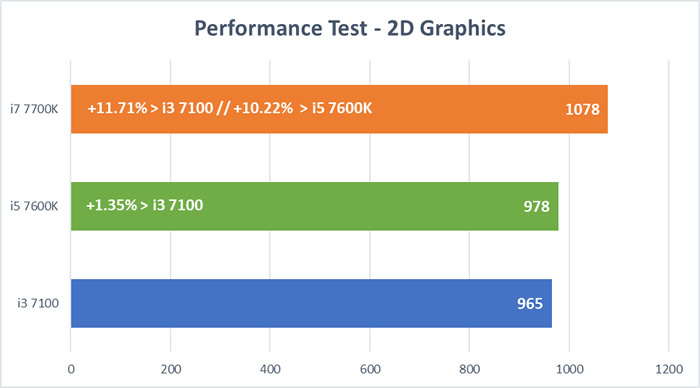 Our Performance Test suite of benchmarks take the CPU, RAM, Hard drive, 2D and 3D graphics test results into account to give an overall system score. Backing up the overall trend displayed in the above tests, the Performance Test software tells us that switching from an i3 to an i5 processor will give just under a 16% boost in performance levels across the system overall. The biggest area where the i5 has an advantage is in the CPU and multi-tasking benchmarks, this is down to the greater amount of CPU cores available to the system which allows more things to happen at the same time. Moving from an i5 to an i7 gives another 10% boost in performance, again the CPU and multi-tasking test results show the biggest gains here. Switching from an i3 to an i7 in your new build will boost performance by a decent 27% across these tests as a whole. It’s difficult to give a general answer to the question of which Kaby Lake processor is best for trading, any answer given should be dependent on exactly how you want to trade and use your computer. For this scenario the i3 7100 is a usable and low cost option, it offers decent performance in the single threaded CPU test and isn’t too far behind in the JetStream and Octane web browser tests. Bumping up to the i5 7600K will give you a performance jump of between 8.5 – 15% for web applications and it is also better suited to handling multi-tasking workloads if you ever need them. If you want to run more than one trading system simultaneously and / or you have bigger usage requirements for the rest of the PC then you should be looking at the i5 7600K processor as a minimum, it’s both faster at single tasking than the i3 and can handle multi-tasking workloads far more easily. Moving up to the i7 7700K is a nice, but not essential, upgrade that will give you that extra performance boost in pretty much every respect over the i5. If you have any fairly CPU intensive software running then opting for the i7 7700K is a wise choice, especially if you’re crunching numbers a lot and don’t want to be waiting on the results being produced by your computer. A good example of this would be using large Excel spreadsheets which can massively benefit from CPU’s with lots of processing cores and threads. That completes our in depth look at the Intel Kaby Lake processors from the point of view of using them in a new trading computer system, hopefully that has helped you in being able to make a good decision on your next CPU purchase. Get info on the latest technology along with tips on keeping your trading PC running at it's optimum speed, straight to your inbox.